YZM: Was your interest in her part of a larger interest in women whose stories had been overlooked? MB: Absolutely. This is the third of my books in a thematically-connected series of books that begins with The Other Einstein, which explores the life of Mileva Maric, Albert Einstein’s first wife who was a physicist herself, and the role she may have played in the development of his theories. And there will be more books along these lines, exploring histories of forgotten women from the past whose lives and contributions reverberate today. YZM: How closely did you follow the details of Lamarr’s life? MB: I’m a former lawyer who’s been trained in the importance of research. Researching historical women can be challenge, because records about them weren’t always considered worthy of keeping. And while Hedy Lamarr was a famous person, the more readily available information about her focuses on Hedy the movie star, not Hedwig Keisler, the young Jewish woman from Vienna, or Hedy the inventor. That said, I adhere to the research as much as possible, although I do write fiction and this is my version of a particular time in the life of Hedy Lamarr. YZM: Did Lamarr really meet Mussolini and/or Hitler? MB: As I mentioned above, the historical record surrounding Hedy Lamarr is oftentimes scant or imbued with the sensationalism attached to her life. Certainly her first husband, Fritz Mandl who was a munitions manufacturer, had many dealings with Mussolini, as he supplied weaponry to him, and the research suggests that Hedy and Mussolini encountered each other on at least one occasion. There is less data to support her meeting with Hitler, although there are rumors that she was indeed introduced to him. Certainly she would have been well-versed in the military and political landscape, given her proximity to the epicenter of the events leading to World War II. YZM: Did she have an actual conversion to Christianity? And did she later deny her Jewish heritage? MB: Again, keeping in mind the limitations of the research, it seems as though Hedy—who was born into a Jewish family, but we know little about the extent of their religious practices—made some sort of perfunctory conversation to Christianity prior to her marriage to Fritz Mandl, so that they could be married in a particular church. Afterwards, when she met Louis B. Mayer and went to Hollywood, she may have had to deny that she had Jewish heritage, as that was a typical practice. YZM: What about her scientific achievements? Why do you think these have been downplayed for so long? MB: The story of Hedy Lamarr’s invention and the marginalization of her contribution to spread spectrum technology—whether intentionally suppressed or forgotten—is the story of many women either in the STEM field or who have made STEM contributions. In this way, Hedy’s narrative—as I share it and shape it in The Only Woman in the Room—is both historic and modern. YZM: Why did you choose to end your version of Lamarr’s story in 1942? 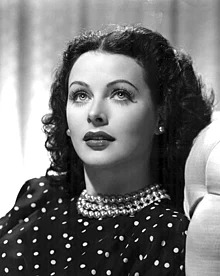 MB: I believe this particular invention by Hedy Lamarr is an expression of her authentic, interior self. When that truth was denied and she was valued primarily for her exterior self, as evidenced by the military sending her off on a war-bond raising tour instead of utilizing her invention, it became a pivotal event in her life.